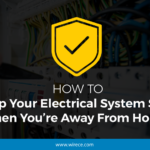 Time and again, we at Wire Craft Electric have been consistent in warning our clients – and you, our beloved followers – against exposing electrical components to moisture. This is especially critical in moisture-prone areas such as the kitchen, bathroom, and the outdoors. But have you stopped to think why water and electricity don’t go well together? In its purest form, water is an electrical insulator. Meaning, it shouldn’t be able to conduct electricity or allow current to flow through it. The danger lies with the components dissolved in water, specifically the ions in it. Although pure water doesn’t conduct electricity, this form of water doesn’t come naturally. In fact, most of the water that we come into contact with – tap water, bottled drinking water, or rain water – contain ions from varying sources. Ions are particles that are electrically charged in their natural state and are good conductors of electricity. These particles turn the inert water into a natural electrolyte that allows current to pass through in the presence of an electric voltage. Pure or distilled water does not contain ions, and so it won’t conduct electricity. Even if you’re absolutely sure that you’re using distilled water, it will only be a matter of time for the water sample to get contaminated by several factors – sweat from your skin, suspended particulates from the air, or dirt from the container’s surface. Having said that, the best safety tip is to keep water and electrical components away from each other. Keep hands dry when handling electrical wires and plugs. You don’t want to become a human electrical conductor, do you? Unplug electrical appliances when not in use. This is especially critical in moisture-prone areas – say, a hair dryer inside your bathroom or an induction cooker beside the kitchen sink. Keep electrical devices and extension cords away from water puddles or running water sources. Hire a professional electrical contractor to install electrical connections in swimming pools or bathrooms. Use battery-operated appliances instead of electricity-driven devices for areas near water sources. If you want to be absolutely sure about the electrical safety in your home, give us a call at Wire Craft Electric. Our professional electrical personnel can perform a comprehensive electrical safety audit to identify risks and address them before they become worse.